One of the most amazing views over London needs an amazing automated hinged window system to match. This glass roof window is split into two panels; the lower one is static, and also performs as a safety balustrade when the upper part is open. An electric motor lifts and closes the upper element by gas struts. The upper section, at 3.7m by 2.4m, is huge and, when open, provides a stunning view with no obstruction. A rain sensor closes the roof if the weather changes, however the window can be set to stay open and act as a rain canopy. The breeze curling gently in on a summer night brings the sense of being outside whilst tucked up in bed. Talk about ‘glamping’ – this really is it; the view, the wind, the birdsong and the night sky, all from the comfort of your own bed. However, if the weather changes, a press of a button has the roof closed again in around 35 seconds. A battery-powered back-up emergency system allows closing of the 950kgs roof in the event of power or systems failure. 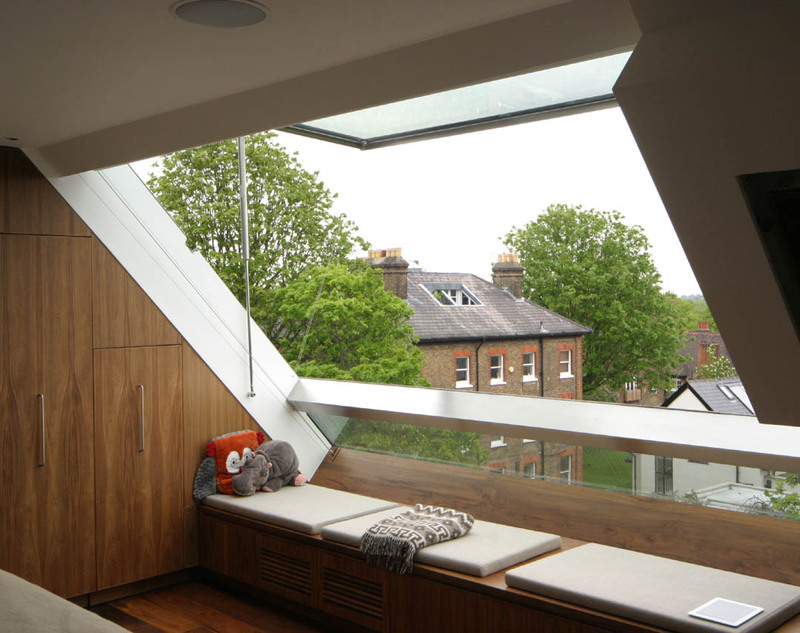 A large pitched glass roof window that opens upwards, providing light, views and ventilation. 3.7m by 3m.